Which one or maybe both? The sister islands of Ko Yao Noi and Ko Yao Yai just off the east coast of Phuket are both worth a visit for their peaceful beaches and back-to-nature feel, but if you have time to see only one, which is better? 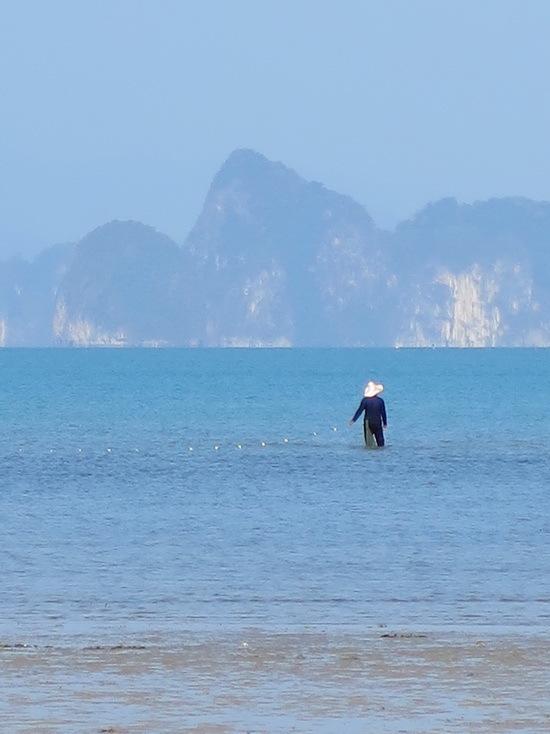 Well, first off, we heartily recommend a visit to both if possible since both have incredible views across Phang Nga Bay, and both are great for outdoor activities including cycling, snorkel and diving trips, kayaking or simply strolling the mostly empty beaches. Both islands are perfect for travellers looking for a low-key alternative to the party scene and overdevelopment of some other Thai islands. And both are family friendly. Decisions, decisions. The view over to Ko Yao Noi from Ko Yao Yai's northeast. But if you’re really pressed for time, your first Yai versus Noi consideration is accommodation. For a splurge, Ko Yao Noi has a better choice of luxury resorts including the acclaimed Six Senses resort and the lesser known yet still fantastic Koyao Bay Pavilions and Koyao Island Resort. ... and also on Ko Yao Noi. Ko Yao Noi also has a better selection of budget to flashpacker accommodation, including the Hill House bungalow with its superb sunrise views, the cheap and cheerful Nam Tok bungalow, Sabai Corner and Baan Tha Khao bungalow. Solo travellers will probably prefer Ko Yao Noi since its accommodation choices are geared more towards independent travellers. Flashpackers welcome. 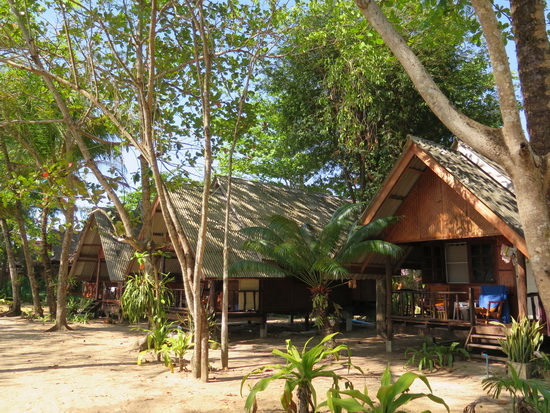 Baan Tha Khao bungalows on Ko Yao Noi. For those wanting midrange prices with some added comforts, like swimming pools or air-conditioned rooms, better room choices are found on Ko Yao Yai. Travellers with kids in tow might have an easier time on Yao Yai, too. 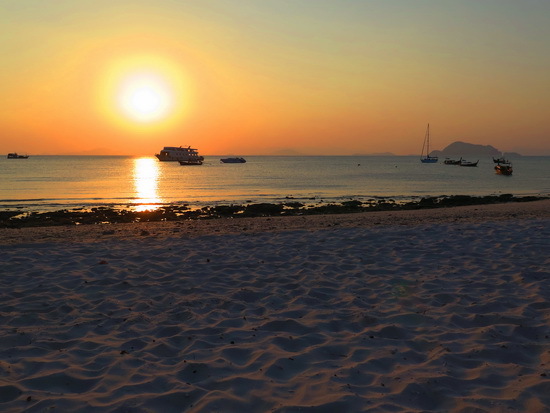 Thiwson Beach Resort is our top midrange pick on Ko Yao Yai, while Yao Yai Resort on the west coast beach of Loh Paret is a great spot for sunset views. 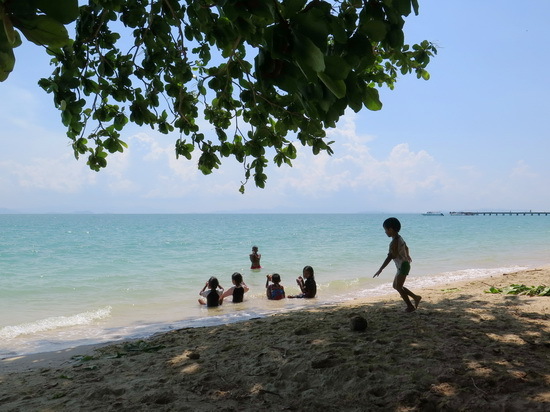 Loh Paret beach is also the best swimming spot to be found at both islands, since it doesn’t drain out at low tide like most other beaches. Desperate for a pool resort that won't break the bank? 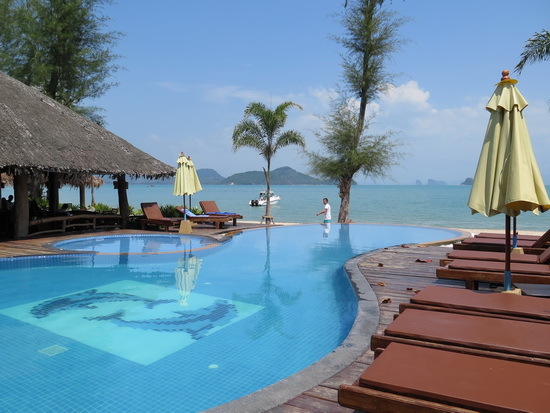 Then go to Ko Yao Yai; this is Thiwson Beach Resort. 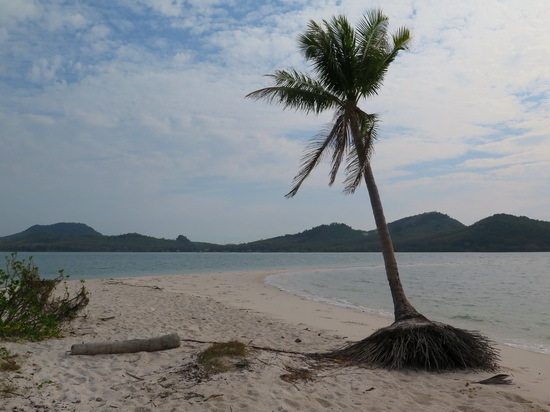 Rating a beach is a highly subjective matter, but we were more wowed overall by the beaches of Ko Yao Yai. The sands are mostly lighter and finer than those of Ko Yao Noi, especially on the aforementioned Loh Paret and Loh Jark beach, which is the arrival point for one of the Phuket ferries. Though a pier slices through the middle of it, Loh Jark is blinding white and is also a perfect vantage point to watch the sun go down. 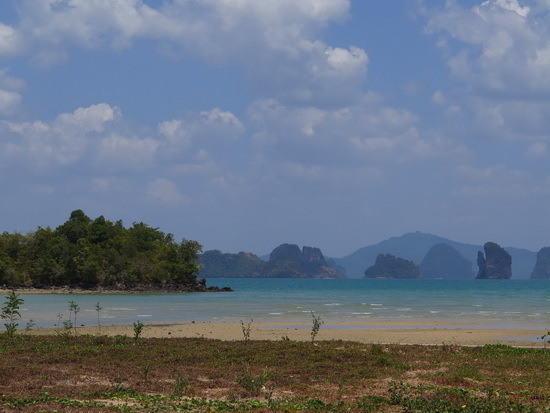 Laem Had beach on Yao Yai’s northeast corner (pictured at the top) is another white-sand stunner, with zero development and a true castaway feel – on our visit we were the only ones there. For ocean swimming, Loh Paret beach on Ko Yao Yai is best. And though both islands are developing in a low-key way, Ko Yao Yai is the place to go if you want to see fewer people and less concrete. Ko Yao Yai’s villages have a more traditional look as well, since the houses here are still mostly built in wood, and some are really quite grand with intricate wood-panel detailing. But both Yao Noi and Yao Yai have a thriving agricultural sector, so you’ll see rice fields, rubber plantations, coconut groves, watermelons and other fruit farms at either island. Sunset on Yao Yai's Loh Jark beach. Not too shabby. For more active travellers Ko Yao Noi probably has the edge, with an emerging rock climbing scene and a Muay Thai boxing camp. It’s also better for a restorative holiday, with Island Yoga, a multi-day yoga retreat, plus spas and fitness facilities at the luxury resorts. As the more developed of the two islands, Yao Noi has a songthaew taxi service and a wider range of dining choices. You'll find rural scenes like this at both islands. This is Yao Noi. The ease of getting to and from Ko Yao Noi and Ko Yao Yai is similar, since most of the ferry services from Phuket, the Phang Nga mainland and Krabi hit both islands on their routes. The boat ride between the islands is only 10 to 20 minutes. However, if you’ve hired a car on Phuket and want to bring it over then you’ll have to go to Ko Yao Yai since it’s the only island with a car ferry service. As well, there are three departure points from Phuket to Ko Yao Yai, the island closer to Phuket, whereas Yao Noi ferries depart only from Phuket’s Bang Rong pier. In a nutshell, Ko Yao Yai and Ko Yao Noi share many of the same qualities, activities and landscapes, so your accommodation budget and needs will be the overriding factor in choosing which one to visit. But really, if you have at least two nights to spend, visit both. With frequent boat service connecting the two, it’s easy enough to base yourself at one of the islands then scoot over to the other for a day.